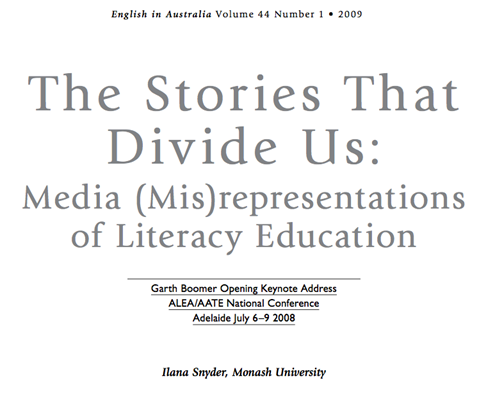 Home Literacies Chapter 6: Functional Literacy Pedagogy Snyder, The stories that divide us: Media (mis)representations of literacy education. Abstract: Over the past decade, stories about the inadequacies of literacy education in Australia have been published with astonishing regularity in the print-media. Literacy teachers are accused of lowering standards by using child-centred approaches that do not provide children with a strong foundation in basic literacy skills. They are also accused of denying young people access to the greats of literature by giving too much attention to popular culture. Dissenting stories are published from time to time but most often are dismissed as the ramblings of loonies who subscribe to the arcane doctrines of critical literacy. As a result, public confidence in literacy teachers has been undermined and many people believe that we have a literacy crisis in our schools. This article provides an account of the media representation of literacy education during the Howard years. It ends by asking whether things have changed since the Labor victory in November 2007.